Green Hunting – Being part of something special…. Over the course of the past 12 months Rhino poaching has once again threatened to burst out of control in Southern Africa. 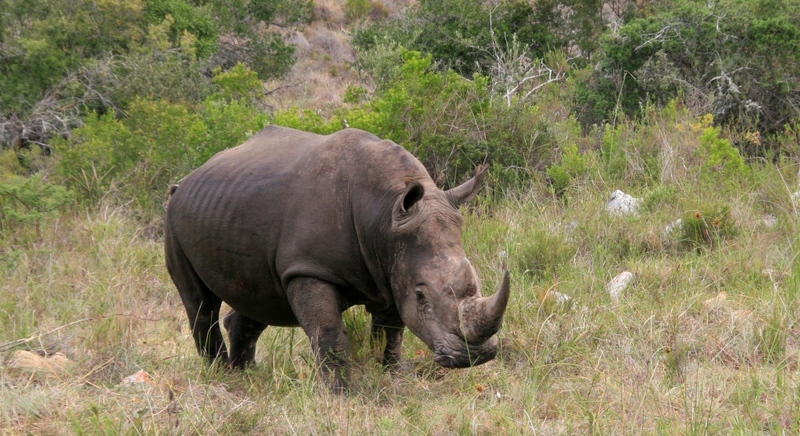 A demand driven by the East in the belief that Rhino Horn can be used as an aphrodisiac. In order to combat this growing problem and to protecting our Rhino populations on private land in South Africa, we have with Nature Conservation, seen the need to Micro Chip all Rhino where possible. 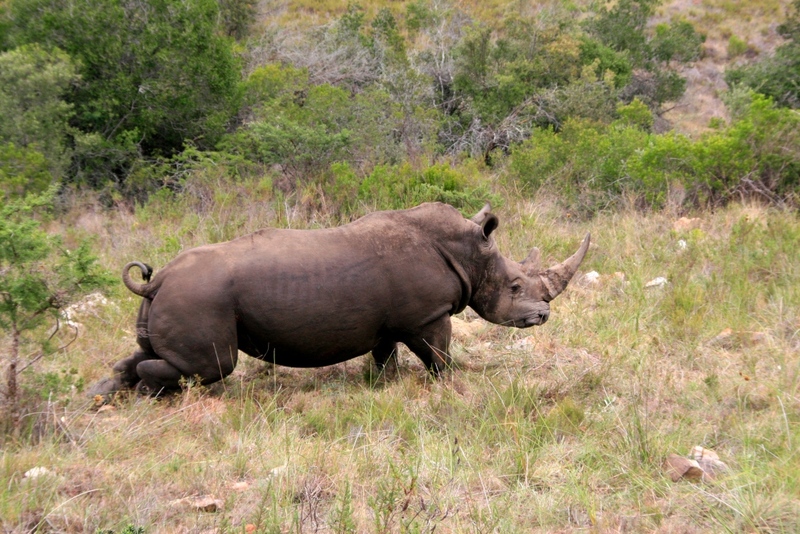 In doing so we hope to form a national register whereby all Rhino are registered in South Africa. In the event where poachers or dealers are caught trading with illegal horn, prosecuting authorities could trace Rhino from where it was poached and hopefully aid in the breaking up of poaching syndicates. For those who are not familiar with the Green Hunting concept, it entails the challenge of hunting the animal as you usually would, but instead of using a rifle as your weapon, you back yourself with a dart gun. Instead of taking home a trophy, you take home your pictures and memories of the experience of reviving the animal to see it stand up and walk away. 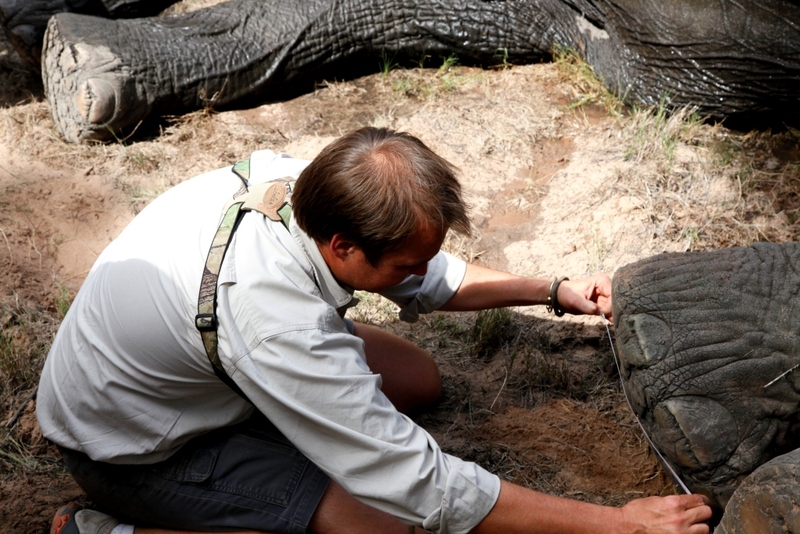 All Green Hunts take place in accordance with the Nature Conservation and is supervised under the watchful eye of a wildlife veterinarian ensuring the safety of the animal at all times. This past week saw Wendell Harsanyi join us on a Green Hunt for a White Rhino and Elephant to complete his Big 5 and help us in the management and conservation of these species on our reserve. Wendell got lucky on the first day of his safari,taking the opportunity when it presented itself. A good Elephant bull crossed his path. 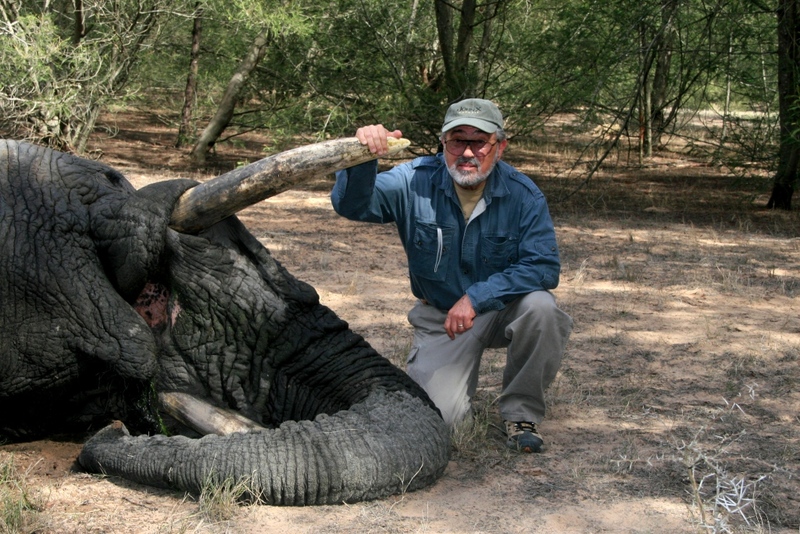 A happy Wendell with his Darted African Elephant. 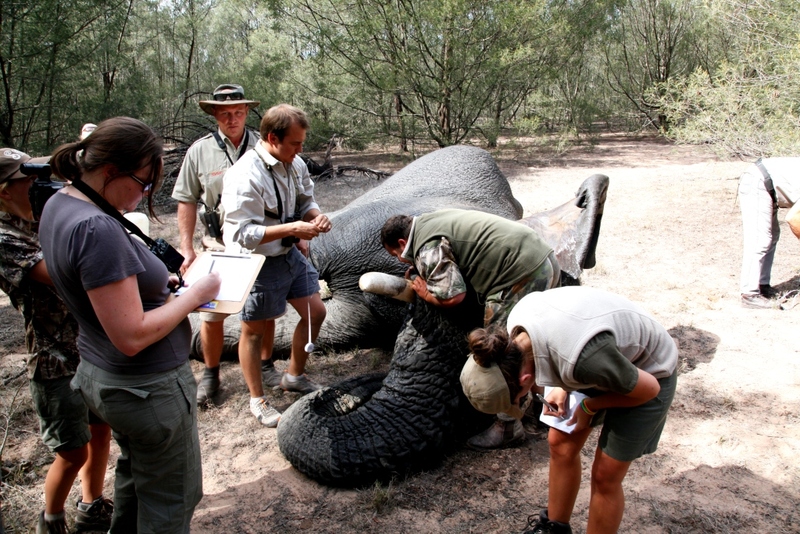 Once the M99 Drug has taken effect and the Elephant is down, the team jumps into action recording important data on the animal. It's always interesting to compare the size of Elephant Bull tracks throughout the areas we hunt in Southern Africa. After the unbelievable start on day one it was a matter of time before our luck ran out. Day 2 saw us turn our attention to Rhino. Several approaches were made on various Rhino, but the Rhino always seemed to have the upper hand. If it wasnt the wind swirling, it was an Impala or Warthogs. Finally, after an exciting stalk and a well placed dart, Wendell had his Rhino and the accomplishment of completing his Big 5. 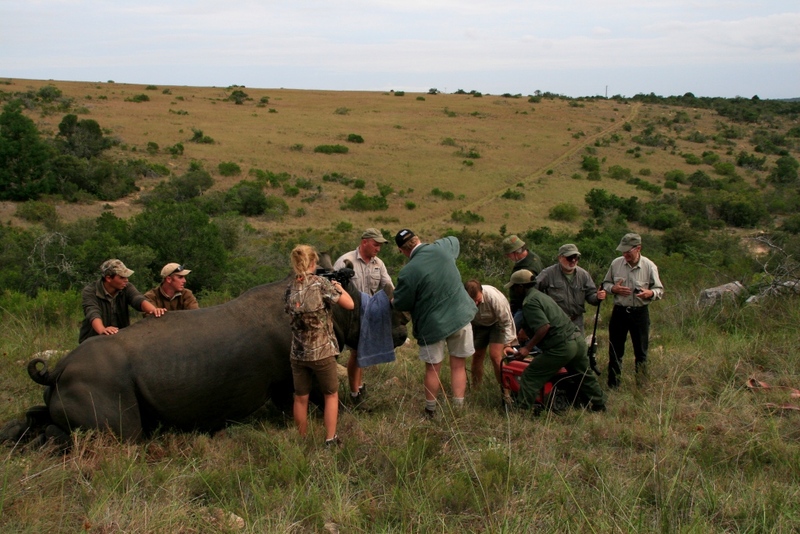 The team arriving at Wendell's Rhino to find it lying down in an awkward position, potentially dangerous for the safety of the animal. Using a winch to secure the Rhino into a better position. Covering the Rhino's eyes for protection and completing identification photos. 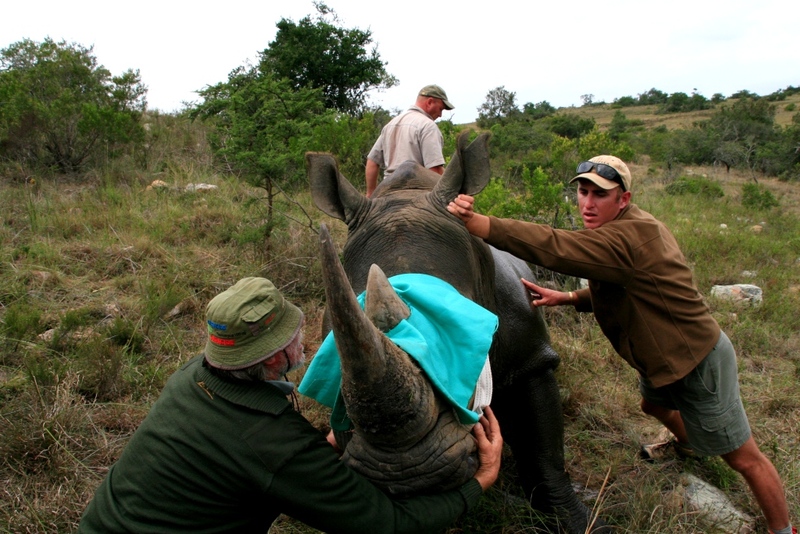 This particular Rhino had been under suspicion due to a bullet like entry wound on its shoulder. 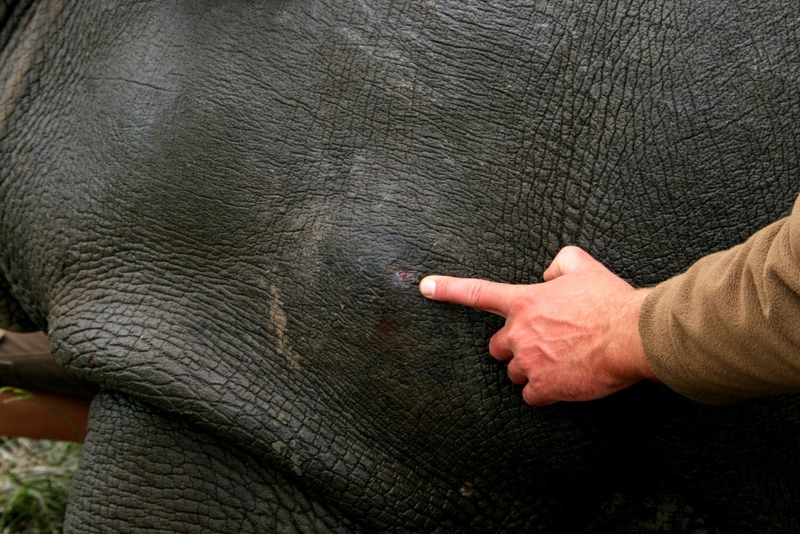 This wound was first noticed by anti poaching in December 2009, since then the animal has shown no signs of discomfort and our Wildlife veterinarian felt no clear evidence was at hand to suggest that it could have been a bullet hole. A possible poaching attempt? The team in action once again collecting data and checking Micro Chips with Nature Conservation Officer Quintus Handjeck. 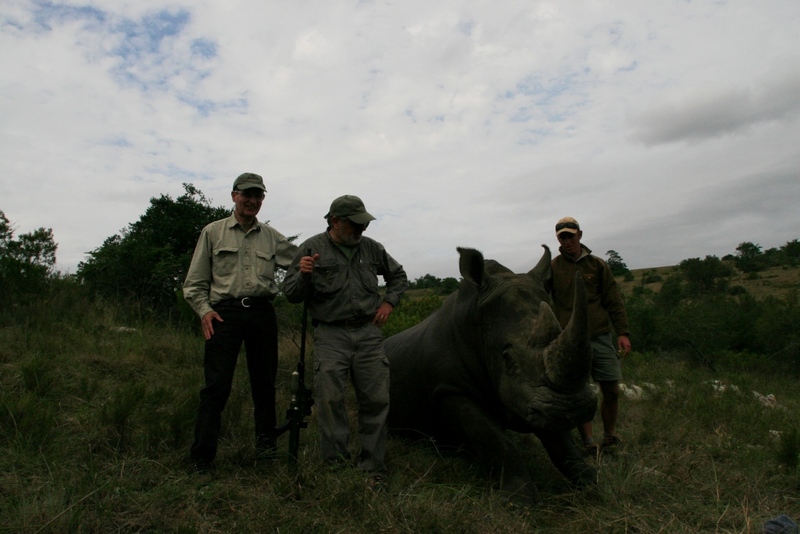 Wendell and brother Charles taking a minute to enjoy a picture with Wendell's darted Rhino. 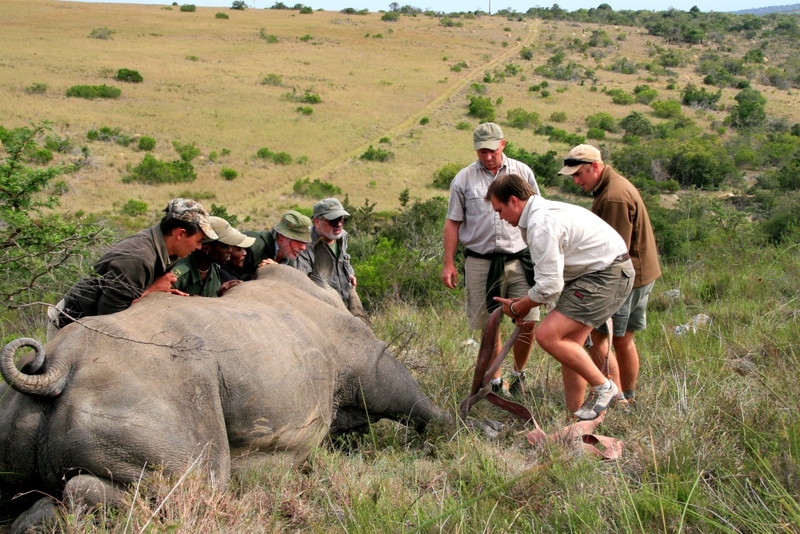 The Rhino getting back to its feet after the reversal drug had been administered to revive it. Wendell's bull moving off after being revived, non the wiser to knowing what an important part it had played in the conservation of its species. John X Safaris has a limited number of Rhino darts left for this season and next year. If there are any hunters who would like to be a part of this conservation initiative please contact us for open dates and rates.